Astronomer Mike Brown at Caltech hunts in the outer reaches of the solar system. He usually concentrates on what is called the Kuiper Belt which extends from the orbit of Neptune out to about twice as far as Neptune's orbit. He recently used the Keck telescope in Hawaii with the intention of imaging Neptune's moon Triton, but the views of the planet itself, and closer neighbour Uranus, were too interesting to ignore. The Keck's adaptive optics system, which compensates for turbulence in the earth's atmosphere, produces stunning results. 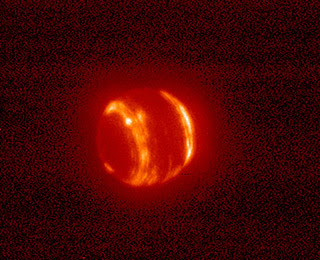 Neptune, glowing like a demonic cricket ball, shows the two distinct bands which are glowing at the imaging wavelength of 1.5 microns (1500 nm). Of course these are not really 'hot' since the surface of Neptune is -200 C and the bright bands will only be a few degrees warmer. These correspond to faint but visible features on Neptune's 'surface'. 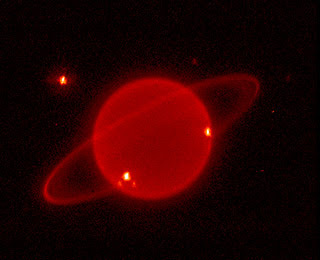 With Uranus the main features are the rings, which stand out distinctly given the low level of radiation from the planet itself, and the spot to the top left which is the moon Miranda. The bright spots on the surface are clouds. This is notable because the 'surface' of Uranus, in visible light, is almost devoid of any features (although, as the 'northern' uranian hemisphere warms up some banding is appearing). There is more at space.com. You can read Wood's 1916 paper on the SAO/NASA Astrophysics Data System (ADS). It is entitled Monochromatic Photography of Jupiter and Saturn.